Rory McIlroy and Jordan Spieth might be the flavour of the week but few sportsmen understand the “twin imposters” of success and failure better than Pádraig Harrington. When it comes to triumph and disaster, the Dubliner (45) gone from one to the other in the space of a hole or two in majors, famously winning The Open in 2007 despite making a double bogey on the 72nd hole. It’s little wonder he was a fascinated viewer two weeks ago when Spieth appeared to throw away The Open before cruelly snatching back the Claret Jug from Matt Kuchar over those enthralling final six holes. Now, with Spieth attempting to become the youngest player to complete the career Grand Slam and McIlroy bidding to end his three-year wait for that elusive fifth major victory, Harrington looks on both storylines with the bemusement of a man who understands that the game is a fickle mistress. He concedes that the game needs the Spieth-McIlroy rivalry to blossom, even if only to give the media something to fill the void left by the absent Tiger Woods. Since Woods’ 281-week run at the top the world ranking ended in October 2011, the world No. 1 spot has changed hands no fewer than 24 times. McIlroy has held it longer than most in total (95 weeks) but he’s alternated at the top with eight different players – Lee Westwood, Martin Kaymer, Luke Donald, Woods, Adam Scott, Spieth, Jason Day and Dustin Johnson – and his desire to separate himself from the rest again is proving to be more of a hindrance than a help. Harrington watches it all unfold with the nonchalance of a veteran but concedes that it’s crucial for the game that a major rivalry emerges. “You need the excitement in golf,” he said. “You need the drama. We miss the dependability of Tiger being up there. You guys miss him. You could write about Tiger, and if he doesn't win it, he will be in contention on Sunday and give you some sort of credibility. Harrington chuckles at the view that McIlroy is now the heavy favourite to win his fifth major this week, less than a month after being written off. “It’s not two weeks ago and you are writing it as if there was a completely different story to Rory,” he said. “Rory is lucky that he has had this in the past. "He has had his ups and downs and they seem dramatic when he has them. So he has dealt with it in the past, which is great experience. Harrington knows that any number of players, including himself, could emerge triumphant this week and while McIlroy is the course and distance favourite, he admires Spieth’s ability to battle against the odds and come up smiling. McIlroy: "I’ve got nothing to prove; I've never lost faith"
Harrington on Generation X threat - "Rory will win many more majors, but the quicker the better"
With Rory McIlroy out shopping for mistletoe and Christmas crackers, the golfing world is looking to Jordan Spieth to pick up the guantlet in 2015 and challenge the Ulsterman for a major or two. 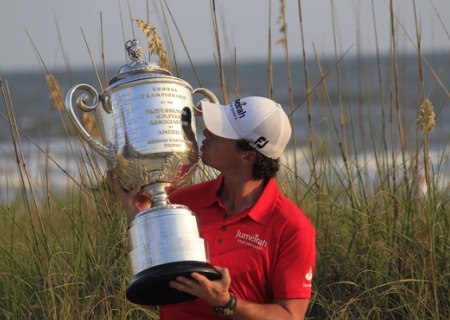 Rory McIlroy found his A game at Kiawah Island. Picture Eoin Clarke/www.golffile.ieJust 420 days after being ridiculed at Congressional for suggesting that Rory McIlroy had the time and the talent to beat Jack Nicklaus’ record of 18 major wins, Padraig Harrington was at it again on Sunday. Oh Paddy, Paddy, Paddy. Perhaps you were right all along.